Ever been invited to a dinner party where the host or hostess sullies the evening by offering caveats for every single thing on the table before you even sit down to eat? Nothing dampens the spirit more than that sorta thing, so we try not to do that to you, dear readers. Although we do have two clarifications—not caveats and not apologies, mind you—that we’d like to make before you set your designs on this lovely little macaroni and cheese recipe. Just to keep expectations in check. First, this recipe turns out a quick, sophisticated casserole that does, indeed, contain pasta and cheese, although some would say the consistency is more like that of an Alfredo sauce than a classic baked macaroni and cheese. Didn’t bother us in the least, but thought you should know. Second, be very careful to only use ovenproof baking dishes in this recipe. Glass or ceramic dishes may not be able to withstand the intense heat of the broiler. So go on, reach for that ugly, battered metal 9-by-13-inch baking pan. Everyone will be so distracted by the macaroni and cheese that they won’t even notice. 1. Bring a large pot of salted water to a boil and cook the macaroni according to the package directions. Drain and set aside. 2. Preheat the oven to 400˚F (200˚C). 3. Arrange the mushrooms in a single layer on a baking sheet, stem-side up, and brush with oil. Season lightly with salt, sprinkle with the herbs, and roast for 15 to 20 minutes, until tender. Remove and let cool slightly. Dice the mushrooms and set aside. 4. Preheat the broiler to medium. 6. Dump the drained macaroni into a large bowl. Stir in half the mushrooms and the hot cream sauce and mix well. Taste and adjust the seasoning. Transfer the macaroni mixture to a 2-quart casserole or a 9-by-13-inch baking dish (be sure your baking dish is broilerproof; do not use a glass or ceramic dish). Top with the remaining mushrooms and Taleggio and a good grinding of black pepper. Broil for 5 to 10 minutes, until the top is golden. Serve immediately. This mac and cheese was heavenly! The combination of cheeses created such a creamy texture with a wonderful depth of flavor. The portobello mushrooms roasted with the herbs contributed an unforgettable earthiness while the tarragon was a flavor standout. I chose to use aged white Cheddar with the Parmesan and Taleggio and loved the end result. I chopped half the mushrooms to mix into the mac and cheese while slicing the other half for the top. I didn’t remove the gills because they stored all of the delicious herb-infused juices. I used a 2-quart casserole dish, which fit the entire yield perfectly. This recipe will no doubt become a go-to for entertaining and/or a quick weeknight meal. Absolutely delicious! This recipe is perfect when you want to serve bubbly hot mac & cheese to a crowd fast. No need to make a béchamel sauce, and the creamy casserole spends only 5 to 10 minutes under a broiler before it’s ready. (Keep in mind that this isn’t a make-ahead recipe. If you make the pasta and cheese mixture in advance and let it cool, you’d have to bake it for much longer than 5 to 10 minutes.) I used extra-sharp white Cheddar aged 9 months (3/4 cup=3 ounces), but ended up adding more (1/2 cup, that’s another 4 ounces) to make the sauce thicker and clingy. It was hard to “thinly slice” the semisoft Taleggio, so I cubed it (I removed the rind, which wouldn’t have melted nicely). The mushrooms (2 medium portobellos were about 10 ounces) and herbs (about 2 teaspoons each) added a deeper flavor and aroma, making this mac and cheese extra satisfying. In fact, I served it as a main course with just a side salad; no one left the table hungry! To be honest, I’m not a big cheese fan, which I know is odd after living in Wisconsin for 6 years. As this recipe uses a few different cheeses, it came to me as a shock that I actually enjoyed it a lot. This was a fairly simple recipe to make. The mushrooms I used were presliced portobellos. After roasting the mushrooms, I cut them into small cubes so that I wouldn’t need to cut the mushrooms when eating the pasta. I decided to put in 1 tablespoon of each of the herbs in the dish. What I really liked most about this was that it was very creamy and the mushroom taste stood out a lot. The mix of cheeses was cumulatively assertive but not overpowering and went well with the earthiness of the mushrooms. My husband isn’t a fan of strongly flavored cheeses but ate 3 helpings of this, despite saying that he found the cheese flavor to be powerful. (It seemed mellower upon reheating.) Even using the leaves from several sprigs of each herb, the effect of the herbs was virtually unnoticeable in the final product. To get more of the tarragon, I think it’d be a good idea to mix in some extra with the contents of the baking dish before it goes under the broiler. Two portobellos (10 ounces) didn’t seem like enough for the casserole. I removed the gills before slicing and sliced the mushrooms about 1/4 inch thick and then each piece in half again. I used a 9-by-13-inch metal baking dish. 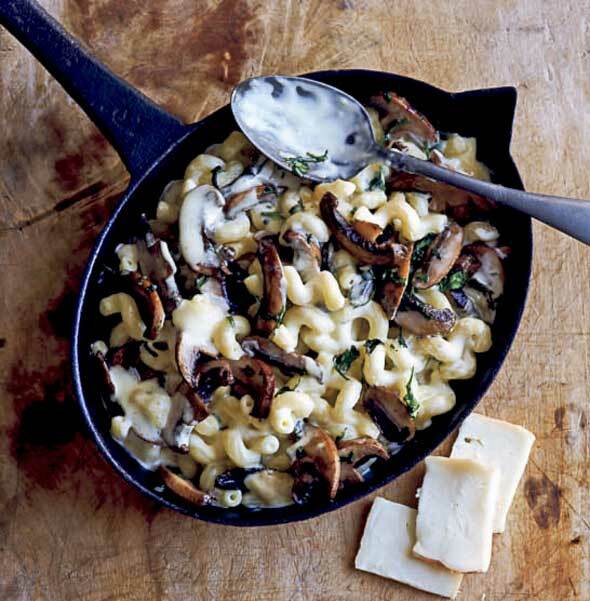 Mushroom Macaroni and Cheese Recipe © 2013 Laura Washburn. Photo © 2013 Steve Painter. All rights reserved. All recipes and photos used with permission of the publisher. It sounds like a great casserole. 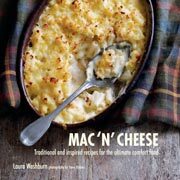 I have an instinctive aversion to macaroni cheese as the ones I first met in America were from a box and my strong dislike of prepared foods kicked in smartish. Then I discovered that the dreaded box mix is available in the UK! Oops! BTW. Why do you remove the stems and gills? And what do you do with them? That seems wasteful and I would leave the gills in and chop the stems smallish. I think I would add white truffle oil. What do you think? I think that sounds atrocious, Frances. Simply atrocious. What time is dinner and may I come? I have an open table for you anytime my friend and a soft spot in my heart.